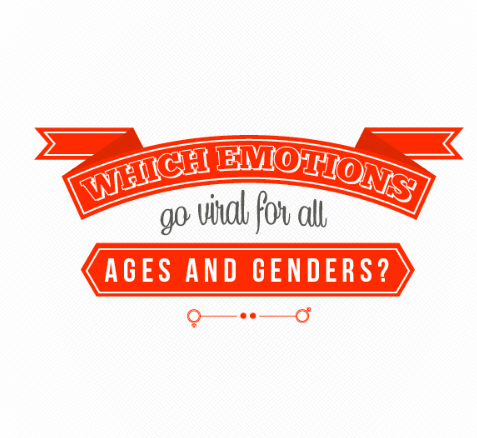 [New Research] Do Viral Emotions Differ by Age and Gender? When was the last time an article made you smile? Or an infographic surprised you with something you didn’t know? For example, the average percentage markup for the services industry is close to 3,000%! The answer just may be different based on your generation or your gender. Content can inspire a range of reactions, but viral, highly shareable images inspire a range of predictable emotional reactions – and those reactions are different depending on age and gender. This is gold for creative teams, because it means that a quick lesson in basic psychology will improve your chances of a viral hit. By showing more than 800 men and women between the ages of 18 – 54 a collection of viral images from Imgur, as well as a set of non-viral images for comparison, we were able to determine which emotions are linked to viral content for different demographics. Their responses were categorized as either positive, negative, or surprised (which can be triggered both positively and negatively) based on Robert Plutchik’s comprehensive Wheel of Emotion. The results give us greater insight into three elements common to how emotions and demographics work together when content goes viral. However, audiences appear to respond differently with positive emotions. By generation, Young Millennials (ages 18 – 24) reported significantly fewer positive reactions than older age groups. By gender, men reported statistically more feelings associated with joy. This may make men an easier demographic to target for initial views, but younger audiences more challenging. Once you earn the audience’s initial view, it’s not enough to stick with only positive emotions. Our study showed that images that provoked a range of emotional reactions – that is, individual viewers reported feeling more than one emotion as they reacted to the image – were more likely to go viral. Recovery Brands incorporated this insight in their Women’s Body Image campaign. There were no study results that indicated particular generations respond with any significant difference in their range of emotions, but there were some nuances by gender. Although men and women responded similarly to the images overall, women showed a slightly greater propensity for emotional complexity. This may make women slightly more inclined to share than their male counterparts; however, incorporating more emotional triggers to balance out men’s predilection for joy could even out the appeal to share among both genders. As you consider which elements you might include or change to include a greater variety of emotional triggers in your campaign, take note that the two least-reported emotions in our viral image group were anger and disgust. This may mean that viewers are less likely to share images that elicit these two feelings. Recovery Brands’ Drugs on Campus campaign achieved this with an in-depth study of drug and alcohol related arrests on college campuses. However, surprise may not be so easy to achieve with every audience. Both younger and older Millennials (ages 18 – 34) reported significantly fewer emotions in this range, which may make them less likely to share content that is not particularly new or unique. Publishers are taking notice of this trend, to. In a recent survey, 54% of online publishers said they preferred receiving pitches based on exclusive research or breaking news. One theory on this finding is that this study used static images, one of the most well- and longest-established mediums on the internet. Millennials have been online for a greater percentage of their lives than any other generation, and thus may have become desensitized to these types of images. How can marketers counteract this effect? Consider whether your campaign might be suited for a more dynamic presentation, such as flipbooks, interactives, or infographics (like the flipbook below, which has the full report of our research! ).